The Porsche 911 has long been the measuring stick for what a sports car should be. Now the BMW i8 has come along with its hybrid drivetrain and it has its eyes set on taking down the King. But is what represents the future of the sports car anywhere near the tried and true past? On paper the i8 from a cost and performance stand point matches up closely in specs to the 911 Carrera 4 GTS, but does it in the real world? Click past the jump (or scroll down if you came directly to the full article) to see a video of how the two compare. The BMW i8 is an impressive car with its advanced technology and concept car styling. However it is hard to beat the sound of a flat-six with a smaller engine and electric motors. 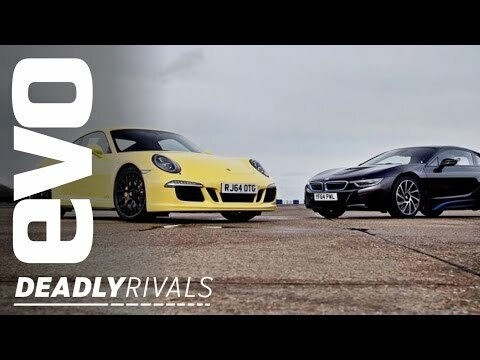 In this video evo takes the i8 and 911 and puts them against each other in a track battle. It first gives you the driving impressions of both cars and then shows the laps of each side by side. Do you think the Porsche will keep its place at the top of the hill or will the BMW show that the future is better than the past?